Stephen Colbert Pulls a Fast One! 1. 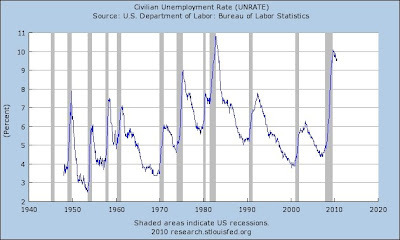 A higher unemployment rate. 2. A household net worth well below its peak (adjusted for inflation). 3. 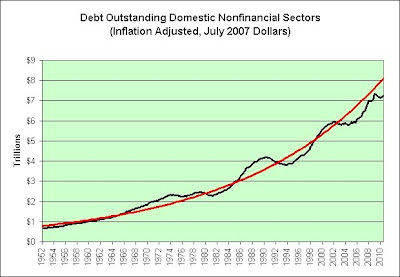 An unsustainable growth in the national debt (adjusted for inflation). 4. 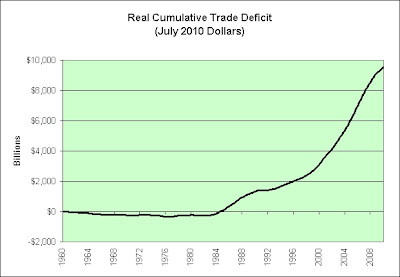 An unsustainable trade deficit. That pretty much covers the main points of my blog over the past 3 years. About all it is missing is income inequality, but I think that might be indirectly included in the drop in net worth. Subprime NINJA mortgages? You know what? As seen in the chart, maybe 1980 wasn't so bad after all. 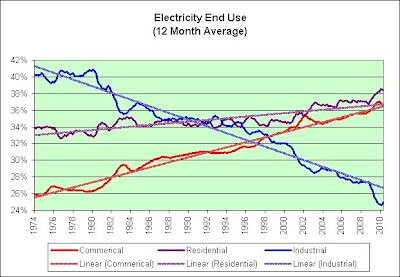 This post inspired by energyecon and the Alternate Misery Index found there. I'm speaking of Ken Fisher's thoughts on the "new normal" of course. No disrespect intended. “We are chimpanzees with no memory,” Fisher said at the Forbes Global CEO Conference in Sydney. Can't argue with that. He makes a great point. Certainly won't see me dragging up old posts from 2007. That's all water under the bridge. It's all completely forgotten. July 2007? 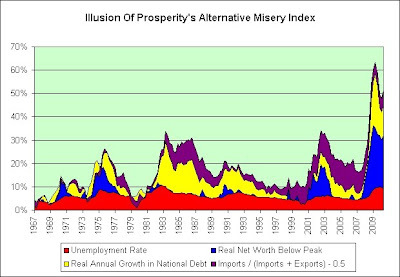 Hey, that's just one month before I started an "Illusion of Prosperity" blog. I went bananas over our new republic! Get it? Chimpanzees? Banana republic? Hahaha! Sigh. Snarky? Snarky??? Oh my!! We always get that around here. You betcha. Just look at my post labels. This is the 668th post with sarcasm in it. We can quibble about the details of course. For what it is worth, here's my second sarcasm report on the day I started this blog. I think it still applies here. President Bush confidently predicted the country would safely weather the financial storm. We weathered it just like Ken Fisher predicted. We're still weathering it. It's like a 3 year tour. 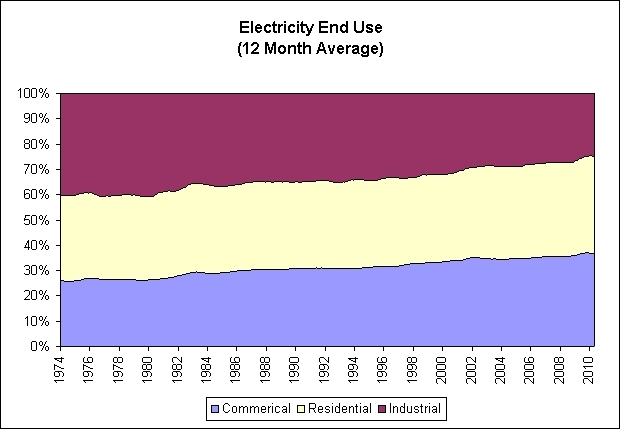 The following chart compares the usage of electricity (in Mkwh) for residential, commercial, and industrial uses over the previous 12 months compared to the total of the three. So what's the problem? Here's that same data plotted a different way. The chart screams two things to me. U.S. imports from China tend to be much more labor intensive than U.S. exports to China. That means our trade deficit is causing even more employment pain that would normally be expected. Roughly 25% of the nation’s leased office space is set to expire in 2011 or 2012 and tenants are moving into the driver’s seat in negotiating new terms with landlords already pressured by a glut of vacant space. That’s the conclusion of a new report by Encino, Calif.-based real estate services firm Marcus & Millichap. Moody's reported today that the Moody’s/REAL All Property Type Aggregate Index declined 3.1% in July. This is a repeat sales measure of commercial real estate prices. That's today's good news. Here's today's bad news. Crude oil rose the most in two weeks as the dollar dropped against the euro, bolstering the appeal of commodities as an alternative investment. I continue to be a disbeliever in commodity driven stock markets. I still lean deflationary. 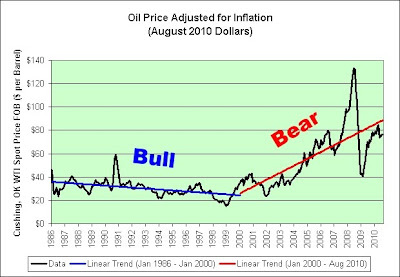 Oil prices are lower now than when I turned deflationary back in November (WTI Cushing Spot was $79.44 that day). I'm comfortable remaining deflationary through yet another Christmas. "I feel it. Today's going to be a good day. I'm going to win something," said Lucinda Clark, 70, as she sat down at a John Wayne-themed slot machine. "This is a beautiful place and it's a good thing for the city." Cross your fingers for Lucinda. She's going to teach the casino a thing or two about easy profits before the day is through. Board Chairman Gregory Fajt said he was excited about finally getting SugarHouse off the ground after all the delays, caused mainly by litigation from community protesters, government agencies and disgruntled bidders. It is a time to be thankful for all we have. Things could be worse! The song begins at the 2:25 mark. Sing along! I do. I want nothing but charmed people around me on this one gentlemen, so bring your good luck stuff. Inflation expectations continue to fall as seen in the spread between Treasuries without inflation protection and those that do. Is it any wonder that the Fed is still worried about deflation? The real inflation adjusted yield of 5-Year TIPS is now scraping along the 0% floor. The real inflation adjusted yield of the 10-Year TIPS is at a new low. The real inflation adjusted yield of the 20-Year TIPS is at a new low. A common question that I see asked on message boards is how low the real yield of TIPS can really go. Note About TIPS: Should the accepted auction yield be 0% or less, the security will not have regular semiannual interest payments. The yield will be adjusted for inflation throughout its lifetime, thus posting changes at maturity (or sale). In this case, where the accepted auction yield is 0% or less, the interest rate will automatically be set at 0% (never anything lower) for all buyers. TIPS did not exist in the 1970s. Real yields on Treasuries without inflation protection did turn negative. Here's the question of the day. Did bond investors willingly accept a negative real return though? I tend to think that they didn't. Inflation just sneaked up on them. 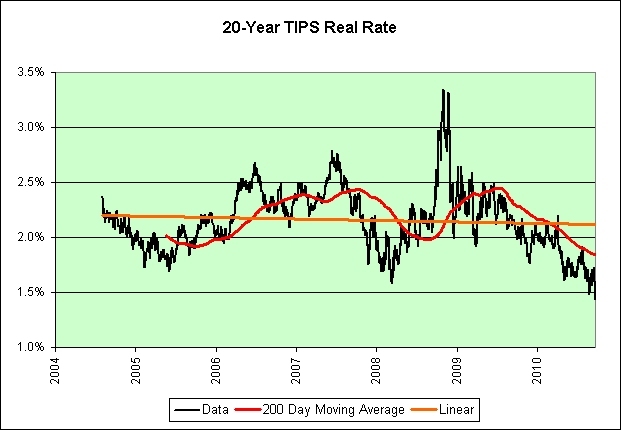 So how low can TIPS real yields sustainably go? I really don't know. 0% would seem to be the floor though. 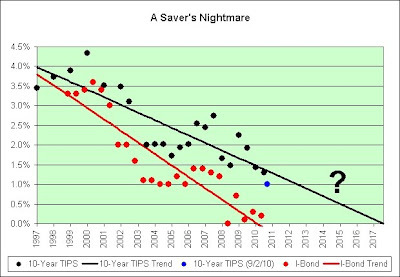 I should also mention that if we slide into an ongoing deflationary mess that the real yield of TIPS (even with a stated real yield of 0%) would be positive. That's because TIPS do offer some deflation protection. You are guaranteed to get your original principal back at maturity if you buy and hold for the full duration of the bond. 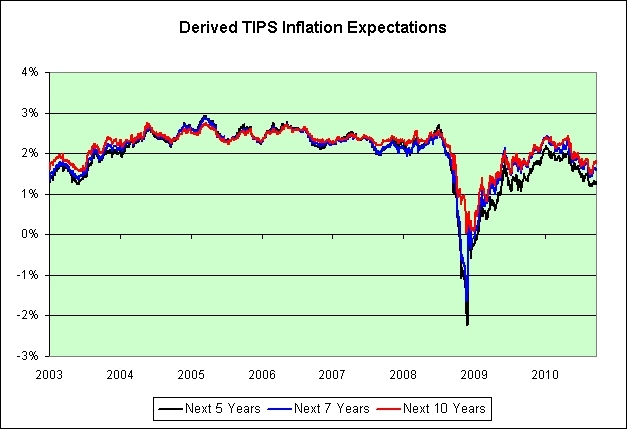 This effect can and is distorting the inflation expectations in the first chart. Here's an article on that. He does a good job of explaining why this is so. But this analysis assigns no value to the TIPS' guaranty of repayment at par. When deflation becomes a serious possibility – i.e., when investors take that possibility into account in their decision making – the TIPS spread is distorted by an upward bias in the price of the TIPS, which makes the spread an unreliable measure of the mood of the market. I would add another factor that is often missing from TIPS spread analysis. 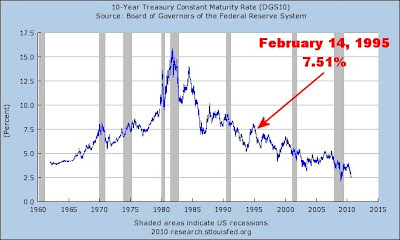 Those who are absolutely convinced that deflation is coming and who are looking for an excellent way to play it would no doubt buy Treasuries without inflation protection. Those who are absolutely convinced that serious inflation is coming and who are looking for an excellent way to play it would not be buying Treasuries with inflation protection though. They'd be buying hard assets instead. 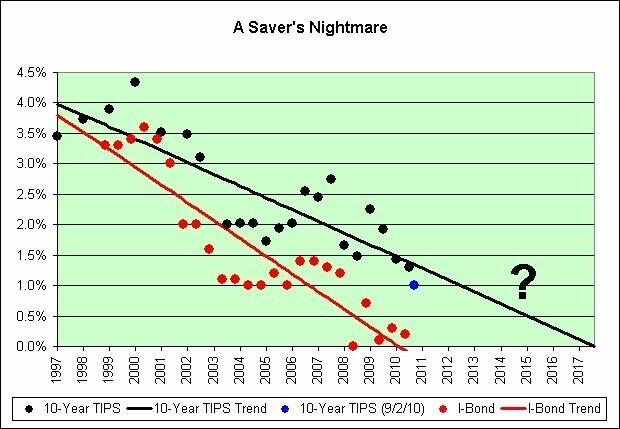 TIPS should not be considered the opposite of Treasuries without inflation protection. TIPS are dollar denominated assets. They are at risk during periods of extreme hyperinflation, if only due to the incredible potential tax burden. 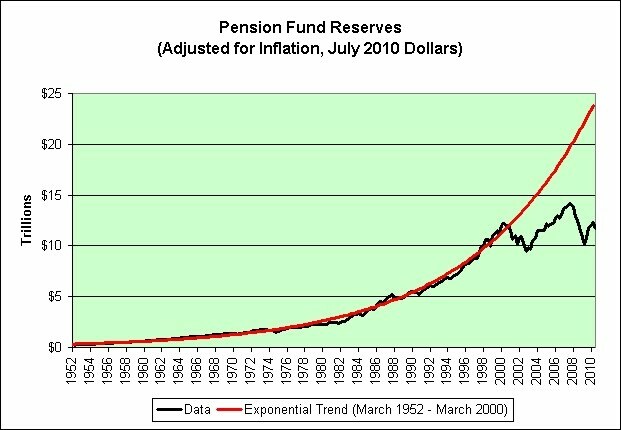 Unlike hard assets, their inflationary gains are taxed each and every year if held outside a retirement account. I am a big fan of TIPS (much of my nest egg sits in them), but they are hardly risk free. Using hindsight, I refer you to one of my better calls. Stagflation did hit in 2008. Oil shot up to $145 per barrel. Inflation pressures did rise. It was short lived though. I have updated those charts to show where we are now. In order to be consistent, I would have to at least entertain the possibility that these current charts offer at least some hope. They do. I find them very encouraging. 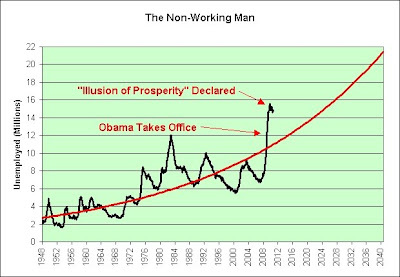 I am not encouraged by our enormous deficits (both budgetary and trade) though nor am I encouraged by the lack of any new job creation ideas. I am therefore much more bearish than I should be if simply looking at these charts. That said, at least it no longer feels like the 1970s. That's something I guess. 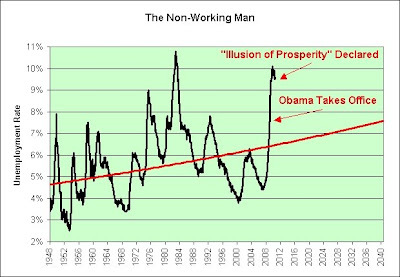 Unfortunately, the data does not go back to the Great Depression. It might very well feel a bit like that. Focus on that blue line in the last chart. 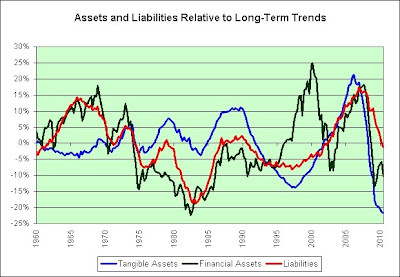 Note its drop in recent years but also note its increasing volatility over the past 5 decades. It's the kind of escalating feedback signal you might get by placing a microphone directly in front of a speaker. 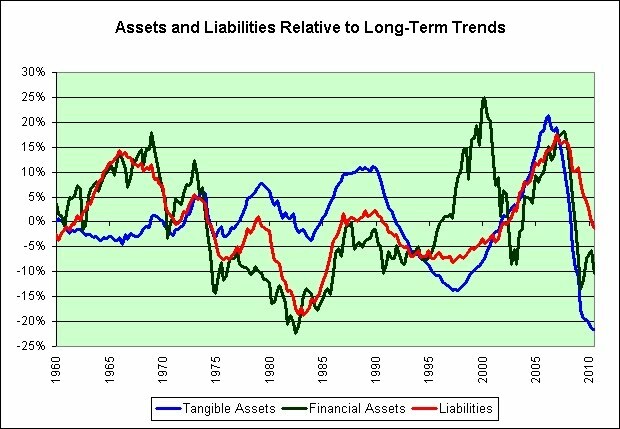 It does not imply tangible asset price stability. Let's just put it that way. The Great Recession ended in June 2009, according to the body charged with dating when economic downturns begin and end. 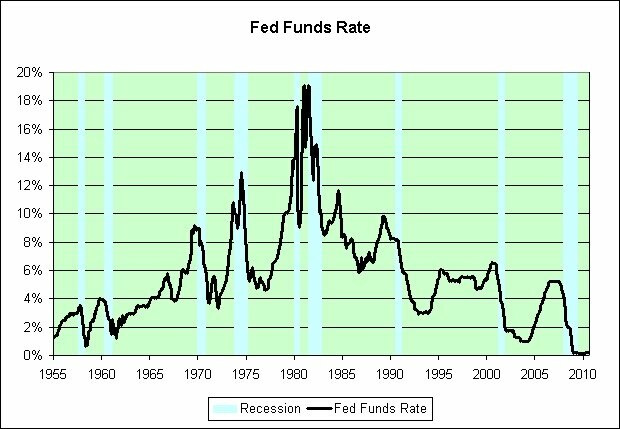 Barring two notable exceptions in the chart, the Fed can now begin to raise interest rates. As a saver, this is fantastic news. Hurray! 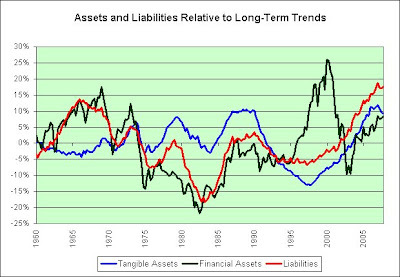 Why are the two exceptions the two previous recessions though? Coincidence? What if the Fed must actually lower interest rates further? We are already at the 0% floor. Oh heck, that's probably just me being a worrier. Time for the party hats! What's going on in the video? Heck if I know. I've never played the world's most popular free MMO. It definitely seems related to the economy though. Special thanks to Calculated Risk: How do you put recession bars on graphs using Excel?. I couldn't do all of it due to having such an old version of Excel but it sure beats the heck out of doing it manually in Paint Shop Pro. Bob Doll from BlackRock was on CNBC this morning and he said corporations are sitting on a lot of cash. He was suggesting that they should pay out more dividends or buy back more stock. 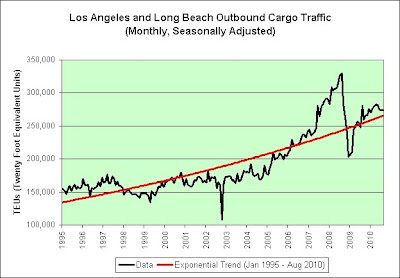 The red trend line is a long-term exponential growth curve. That's a 4.07% growth rate above and beyond inflation. What's $7.2 trillion among friends? Or you heard it from Dallas Federal Reserve President Richard Fisher, who recently said companies were "hoarding cash" but were afraid to start investing. Or on CNBC, where experts have been debating what these corporations are going to do with all their surplus loot. Will they raise dividends? Buy back shares? Launch a new wave of mergers and acquisitions? I heard it today. It prompted me to make a chart. Go figure. Demand and supply will meet. The population is forecast to grow by more than 100 million people over the next 40 years. That means maybe 40 million new households looking for homes. Will there be 40 million more jobs too? 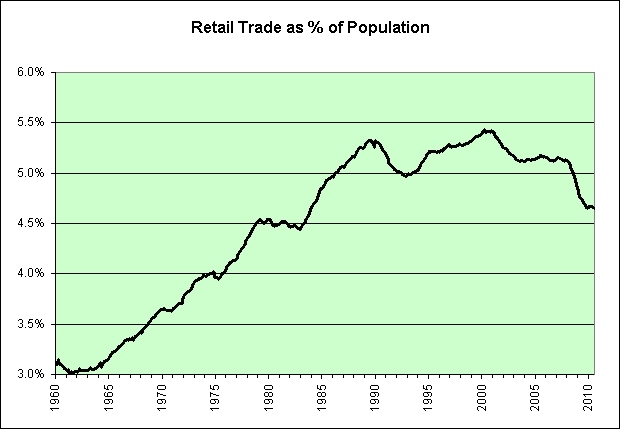 I ask because there's been virtually no jobs added in the last decade and the retail trade bubble may be collapsing. I also ask because 28 people can apparently fit in just one van. Meanwhile, this housing glut will work itself out. 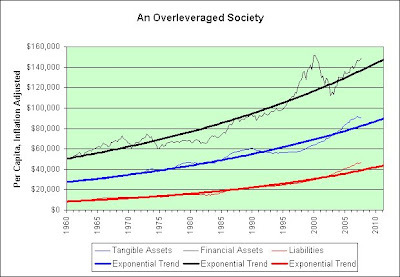 Invest in the glut or forever be priced out? This chart shows the number of U.S. households each year compared to the total nonfarm payroll employment in each year (an average of the 12 months of employment data). 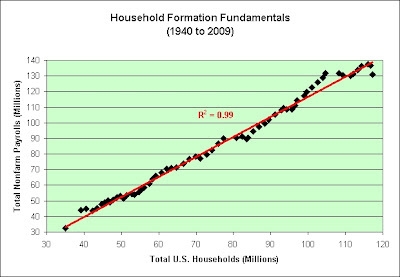 Household formation isn't about population growth to me. It is about job growth. See that point farthest to the right and well below the trend line? That's where we are as of 2009. 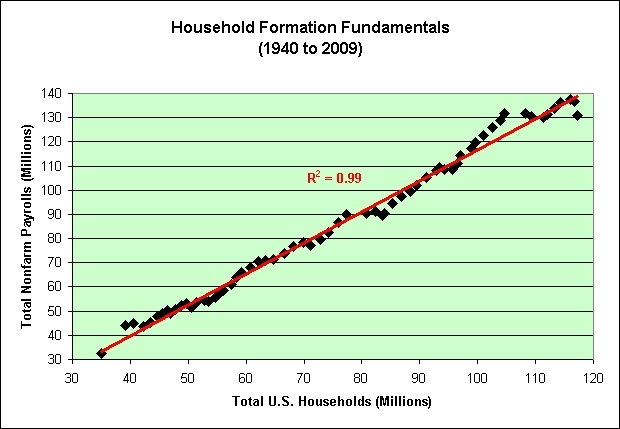 There are either way too many households and/or not nearly enough jobs. I believe with near certainty that it is a combination of both. NEW YORK, Sept. 18 (UPI) -- Overly optimistic assumptions by pension-fund managers could leave U.S. retirement plans with a gap in coverage, an official said. The exponential growth rate trend in the chart above is calculated based on the 48 years of data from March 1952 to March 2000. It is a rate 7.6% above inflation. 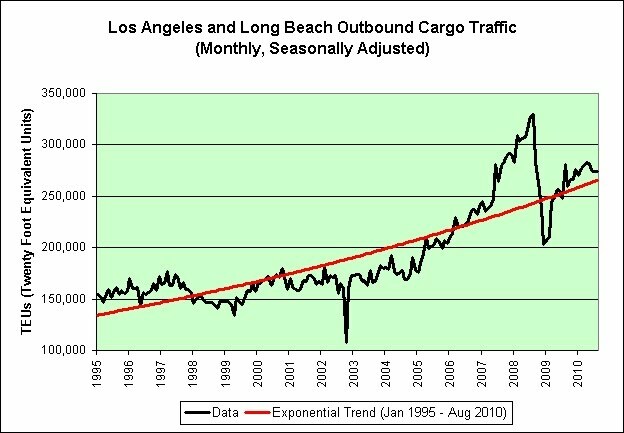 Here's another look of that same data on a log chart. Constant exponential growth will therefore appear as a straight line. A growing workforce population (women entered the workforce) in a post World War II environment greatly contributed to the economic boom. It allowed the workforce population to grow faster than the population overall. 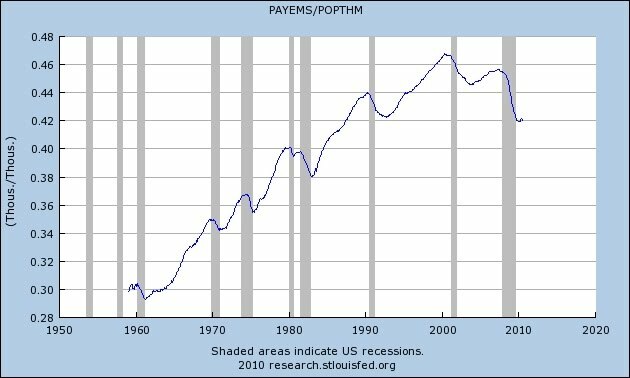 The chart above shows total nonfarm payrolls divided by the population. 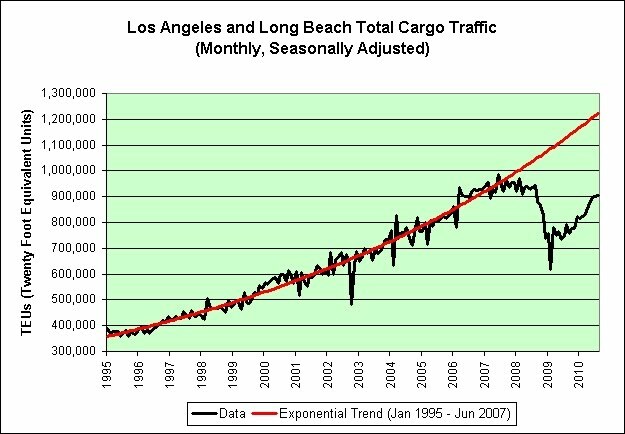 Note the growth from 1960 to 2000. Those days are over. Welcome to pension fund hell. It was requested that I add an option to "subscribe via email". I've added that as an option and have subscribed. This is a test to make sure I did it right. 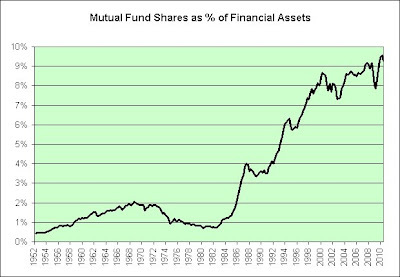 The average equity mutual fund charges around 1.3%-1.5%. 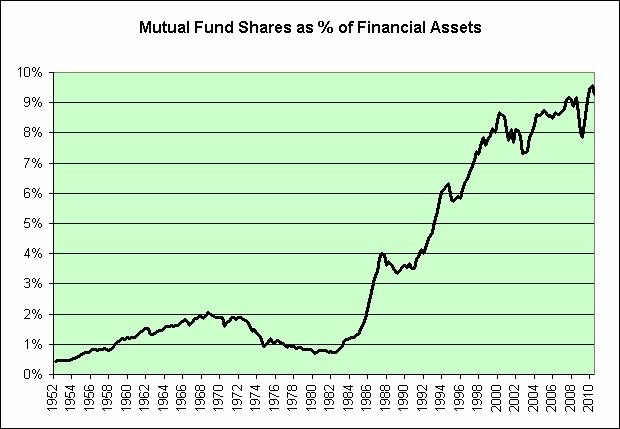 Thanks to the power of compounding, a loss of 1.4% each year becomes a 50% loss in just 49 years. "I called gold the ultimate bubble, which means it may go higher, but it’s certainly not safe, and it’s not going to last forever." Although I have stagflationary in my name and I have owned physical gold and silver in the past (from 2004 to 2006), I have absolutely no interest in owning gold compared to TIP at these prices. I believe gold's "safe haven" status has been very much in question since it broke $1,000. No asset is good at any price. Heck, I even sold TIP recently because I felt it was slightly overpriced. I'll either buy it back if the price comes down and/or bypass it entirely by participating in the 30 year TIPS auction this coming February. I do not believe in "sure things". As we are about to head into the Christmas season, I figured it might be informative to update a few of these charts. Look at all that "shock and awe" our trading partners are feeling. We are now roughly 437,000 TEUs below the unsustainable long-term exponential trend. It's like we hit an illusion of prosperity wall or something. Go figure. That surge in exports is apparently losing its momentum too. Again. Let's hope there are actual customers for all of this stuff. We're partying almost like it is 2007. Well, sort of. It's not entirely like 2007 come to think of it. 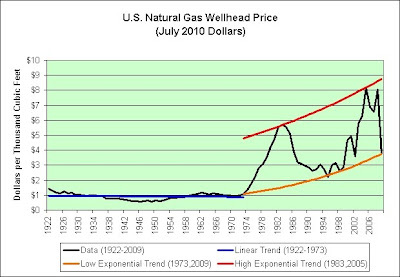 The natural gas bubble popped from its 2005 inflation adjusted high. It is possible that we're now simply at the bottom of its channel and that support will hold. It is also possible that the support won't be there. Part of that surplus comes from increased oil and gas production, particularly from ongoing production in the non-OPEC countries (including the U.S., where a "shale gas boom" has created a natural-gas glut). 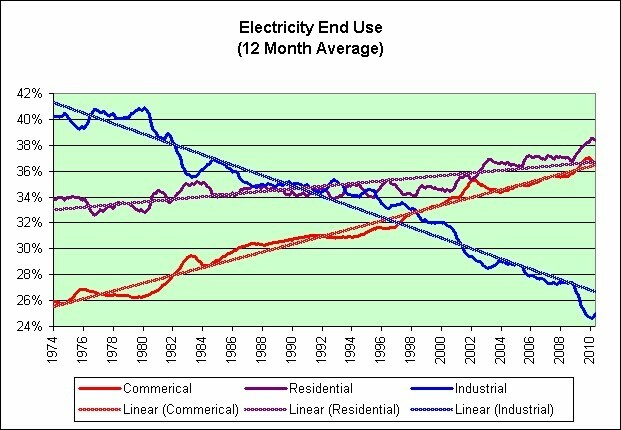 It also comes from flat demand due to the stumbling economic recovery and changing consumer behaviors. Neither of those factors is guaranteed to last. But as the summer driving season passes and students head back to school, awareness has gradually dawned that we may be looking at an oil surplus for years to come. For what it is worth, my behavior was permanently altered in 2004. The inspector general reported that 1,326 single people listed as dead by the Social Security Administration claimed more than $10 million in credits. The IRS threw out 528 of those 1,326 claims, saving $4 million. Rumor has it that these 528 also have accounts at our nation's zombie banks and are still buying zombie products from our nation's zombie companies. The corporate-bond market looks even more like an accident waiting to happen. Investors decided to lend $400 million for 30 years to Stanley Black & Decker Inc. this month. They will be paid an interest rate of 5.2 percent by the toolmaker, which has total debts of $4.5 billion in the form of bonds and loans, according to Bloomberg data. The job of a fixed-income investor is to balance risk and reward. 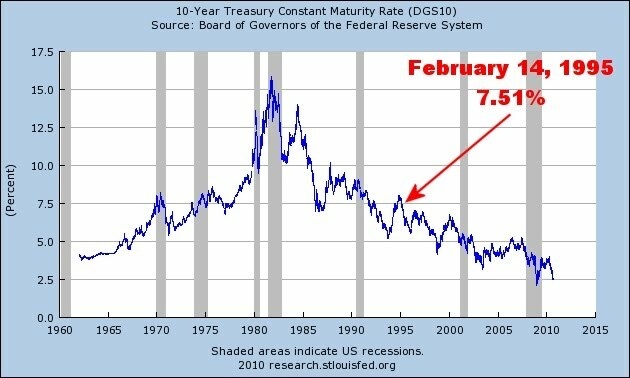 That interest rate seems like an awfully skimpy reward for quite a big risk. Peer three decades into the future. Tell me you don't see some new globetrotting enterprise from China -- where Western retailers now do most of their manufacturing -- employing the workers Stanley Black & Decker trained and undercutting the U.S. company with cheaper screwdrivers, drills and hammers. There's also the connected problem of lax lending standards during the credit boom. The loan covenants that would normally get triggered when a borrower is in distress were watered down to the point of uselessness. So it is entirely plausible that zombie companies are blundering along in the twilight lacuna between alive and dead, distorting the default data. Zombie companies blundering along in the lacuna? Is that our truth? The U.S. ranked 87th for macroeconomic stability, and American businesses also increasingly questioned the government’s ability to avoid meddling in the private sector and viewed it as a wasteful spender, the forum said. In its index of financial market development, the U.S. fell to 31st from ninth in 2008. 87th in macroeconomic stability? Woohoo! Cut taxes, especially for millionaires and billionaires. Cut regulations for special interests. Cut trade deals even if they didn't benefit our workers. Cut back on investments in our people and our future -- in education and clean energy; in research and technology. The idea was that if we had blind faith in the market; if we let corporations play by their own rules; if we left everyone else to fend for themselves, America would grow and prosper. 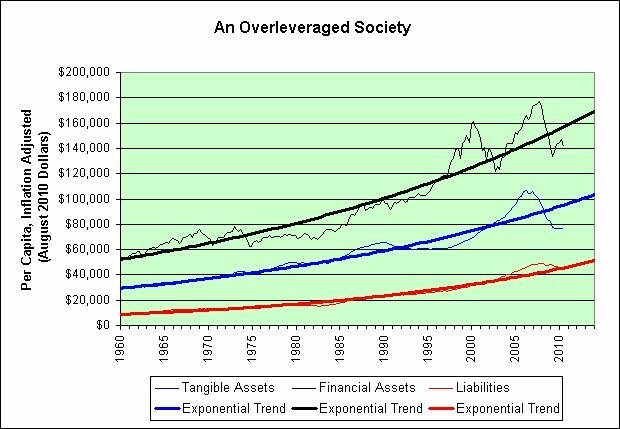 I have included long-term exponential trend lines for your consideration. Special thanks to "jus me" for offering this breaking news in the comments. 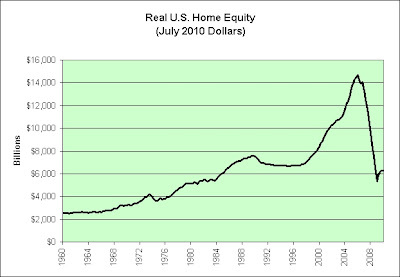 The chart above shows the inflation adjusted total value of household real estate minus the total home mortgages from the first quarter of 1960 to the first quarter of 2010 (as seen in Table B.100 in the Flow of Funds report). The chart above shows the inflation adjusted cumulative trade deficit from the first quarter of 1960 to the first quarter of 2010. 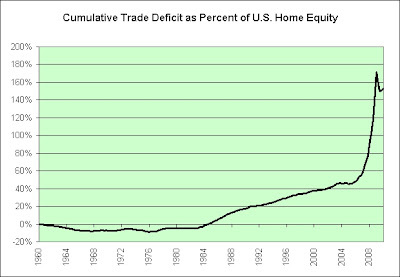 This chart shows the size of the inflation adjusted cumulative trade deficit in comparison to the total inflation adjusted U.S. home equity. 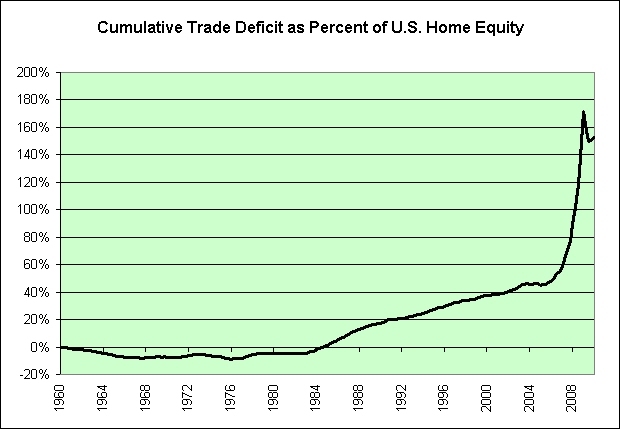 The cumulative trade deficit is the "gift" that just keeps on giving. 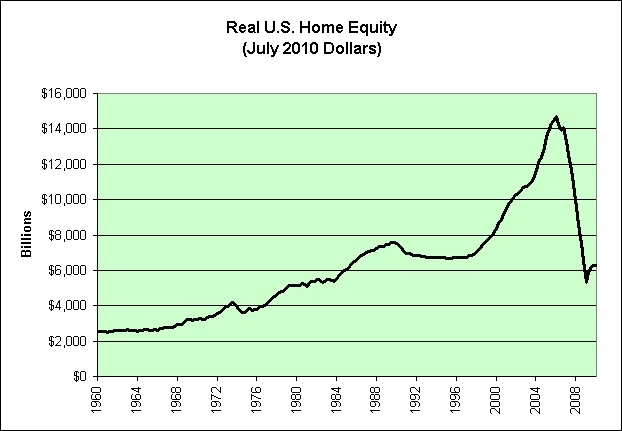 Too bad the same could not be said of home equity. Everyone should worry about inflation. It's been the long-term trend for a century. You can worry about deflation too if you like. I am. Not worrying about either of them is a great way to lose one's nest egg. Here's an update to my chart within the link. I've improved upon it by comparing the inflation rate over the previous 12 months to the average unemployment rate over the previous 12 months. It's now more of a direct apples to apples comparison. The conclusions remain the same though. What pattern do you see in the data? I see a cumulus cloud formation. Maybe I can be an economist too? 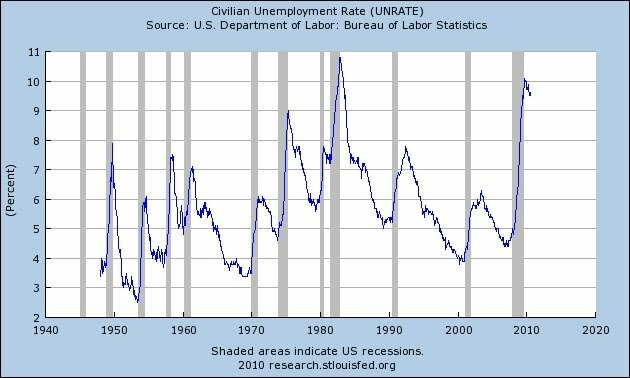 The trend line isn't exactly backing the Phillips Curve theory either, is it? If anything, it suggests that higher unemployment and higher inflation in that very noisy data set go hand in hand. In the years following Phillips' 1958 paper, many economists in the advanced industrial countries believed that his results showed that there was a permanently stable relationship between inflation and unemployment. One implication of this for government policy was that governments could control unemployment and inflation with a Keynesian policy. They could tolerate a reasonably high rate of inflation as this would lead to lower unemployment – there would be a trade-off between inflation and unemployment. 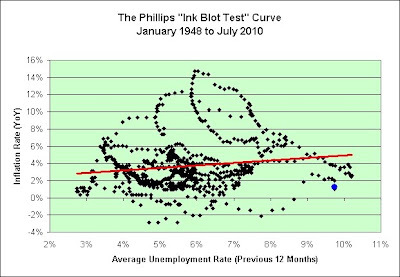 Like the expectations-augmented Phillips curve, the New Keynesian Phillips curve implies that increased inflation can lower unemployment temporarily, but cannot lower it permanently. If the Fed's actions cannot permanently lower unemployment, then that would mean that the Fed is powerless to fulfill one-half of its dual mandate. The first challenge is determining how to interpret the dual mandate. Of course, the Federal Reserve doesn't take a literal approach to the goal of maximum employment. In that case, our policies would need to be directed at getting everyone to work at least one hundred hours a week, and we would have to discourage senior citizens from retiring and young people from attending college instead of entering the labor force. 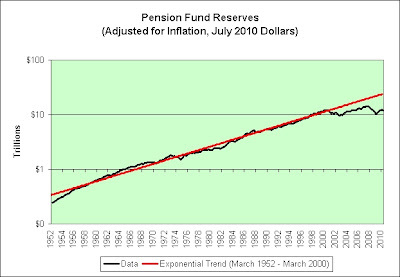 The Fed's policies certainly did help discourage some senior citizens from retiring. First, the Fed wished to punish savers on fixed incomes in order to entice them into taking on more risk. Second, those who took the bait saw their retirement accounts decimated. 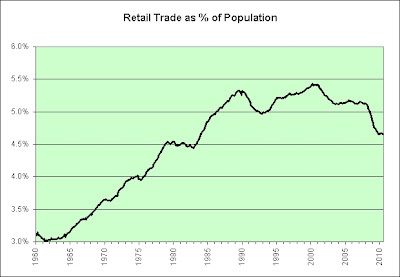 Apparently it hasn't helped our economy all that much though. Go figure. Furthermore, every modern economy has a certain level of "frictional" unemployment, which reflects the transitory periods over which individuals remain voluntarily unemployed while searching for a new job. Partly for these reasons, Federal Reserve officials and other policymakers often refer to this aspect of the dual mandate as the goal of maximum sustainable employment, and they place particular emphasis on the word sustainable. In that case, our unsustainable trade deficit and our unsustainable growth in credit would imply that the Fed knows we are sustainably @#$%ed. But Mr. Bernanke also warned that huge trade imbalances between the United States and the rest of the world had played a central role in the global economic crisis and that they could do so again. What might his solution to the problem be? “The United States must increase its national saving rate,” he said. 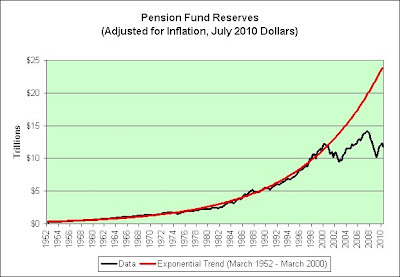 And how would Ben Bernanke implement his solution to the problem? The current Fed policy fits nicely with the Obama Administration's aim to increase spending (both consumer and Congressional) of all kinds -- a policy which discourages any kind of saving and applauds any kind of spending. The performance of the U.S. economy during the 1990s has been universally hailed as stellar. Economic growth has been strong, unemployment has reached its lowest rate in over a generation, and inflation has remained relatively low. The 2000s? Not so much. In both the media and popular opinion, trade deficits often are portrayed negatively, being blamed on the unfair trading practices of our trading partners or on a lack of U.S. competitiveness in world markets. Score one for the media and popular opinion! 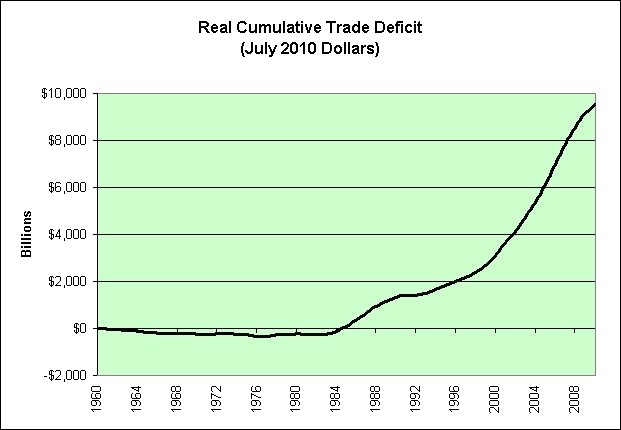 Simple logic suggests that the downward trend established during the 1990s cannot be maintained indefinitely—if it were to do so, the United States would ultimately exceed its ability to pay for the rising tide of imports. Score one for simple logic! This article has described the basic determinants of the current account, challenging the common, but simple notion that trade deficits are inherently bad. Score one for common simple notions! The resulting weakness of the U.S. current account balance is, therefore, a reflection of an economy that is strong, but in transition. A turnaround of the deficit is likely to be an important indicator of when that transition is complete. 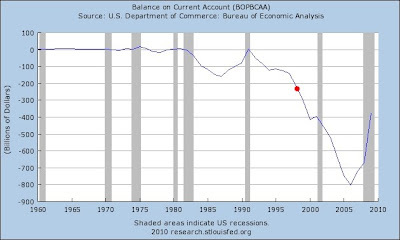 The red dot represents the annual trade deficit at the time of the article. The "turnaround of the deficit" was certainly an important indicator of something. It turned around just before our Great Recession. Score one for the St. Louis Fed! Hurray! 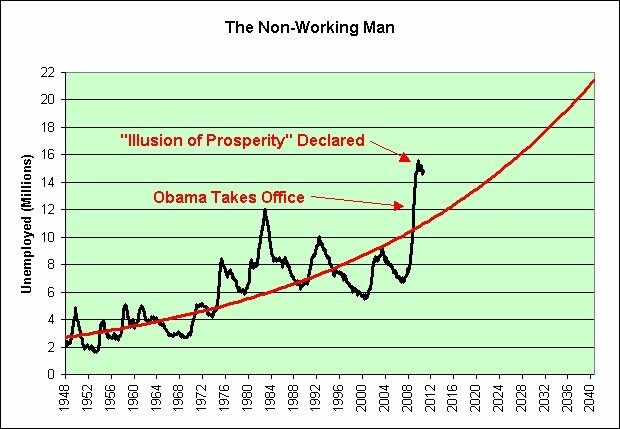 Only after we reach this more mature phase of the current economic expansion will we be able to fully evaluate the claims of those who suggest that we are on the threshold of a new economy in which rising rates of productivity and economic growth will last far into the future. We are definitely on the threshold of something right now. 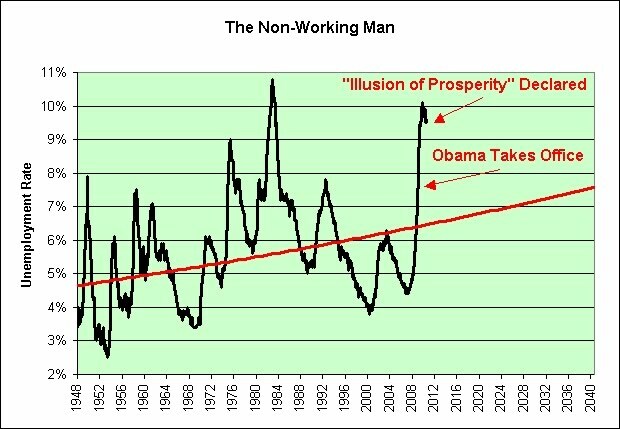 If 11 years of massive trade deficits, 11 years of miserable job creation, 11 years of massive debt creation, 11 years of horrendous stock market performance, and 11 years of pension funds being overly optimistic about future returns are any indicator, then I'd claim we're standing on the edge of a cliff. Just a hunch. The June report seemed to ask more questions than it answered. For one thing, the surge in imports didn't square with the sense that the economy had hit a soft patch and consumers were reluctant to spend money. Another puzzle was that the imports didn't seem to show up anywhere. At least they were not where they would typically be found: either in inventory data if they ended up on store shelves, or in the sales reports. In other words, imports, like a missing sock between the washer and the dryer, have simply disappeared. For what it is worth, I think our entire economy is lost between the washer and the dryer. It's been a lost sock decade. 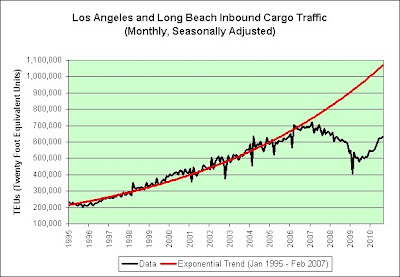 The red trend line shows the exponential growth from January 1973 through November 2007. 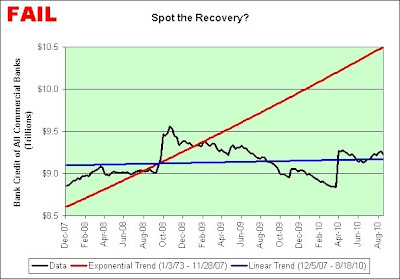 The blue trend line shows the linear growth from the official start of this recession in December 2007 to August 18, 2010. Congratulations New York! Your pension fund has successfully time traveled to February 14, 1995. As seen below, the Valentine Day's wormhole would also help explain the overabundance of New York State Chihuahuas, Pomeranians, end tables, and ladies' buttersoft lambskin swing coats. Ever hopeful, Michael Javer offered up chihuahuas at half price this week. "We find sometimes that people think of puppies on Valentine's Day as a sign of warmth, love and all that good stuff," said Mr. Javer, the manager of American Kennels on the Upper East Side. Of course, his instincts are hardly unique. All week, retailers have wooed shoppers with promotions for things they never knew they needed, like discounted Pomeranians, end tables and ladies' buttersoft lambskin swing coats. The index is rebalanced on the last calendar day of every month, and a sovereign debt issuer is removed if it defaults on any of its debt, including noninflation-linked bonds. I can't speak for you, but it brings me great comfort to know that if a sovereign debt issuer defaults on any of its debt and a likely panic ensues, then BlackRock is fully committed to joining in on the panic too. No price is too low! Everything must be sold! Sell! Sell it all! Sell it all now! BlackRock said in its filing that the Global Inflation-Linked Bond Fund will be passively managed, but it reserves the right to invest up to 20 percent of assets in futures, options and swaps contracts, as well as cash and cash equivalents. Maybe the passively managed Global Inflation-Linked Bond Fund ought to stay 100% invested in Global Inflation-Linked Bonds? 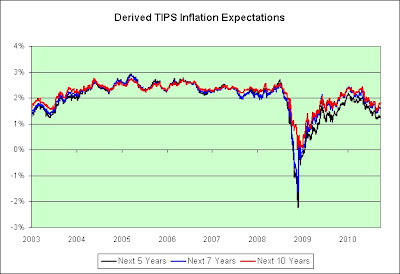 The black 10-Year TIPS data points show the results of every 10-Year TIPS auction (does not include reopenings). 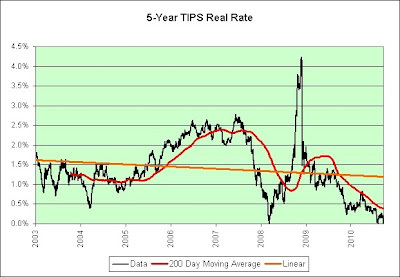 The blue 10-Year TIPS data point is today's rate, as seen at Bloomberg. We've seen I-Bond rates fall to 0% (currently 0.2%). We've seen 5-Year TIPS rates fall to 0% (currently 0.13%). 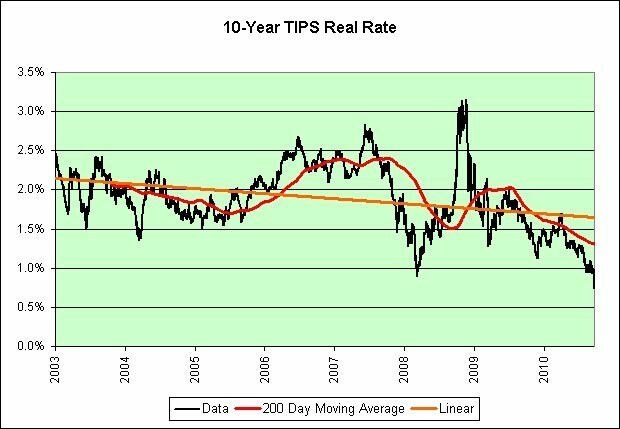 Are 10-Year TIPS rates next? 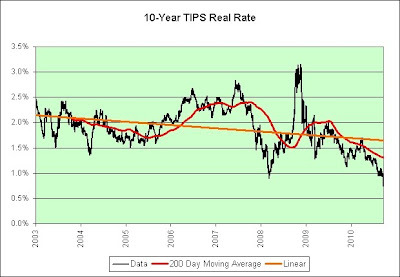 As long-term holders of TIPS, we need only suspect that the long-term direction of future real yields is down (that's the most important thing that determines what TIPS are worth). I not only strongly suspect that real yields will fall, but I'm actively betting on it. Real yields were actually negative in the 1970s. Few seem to know/remember that. 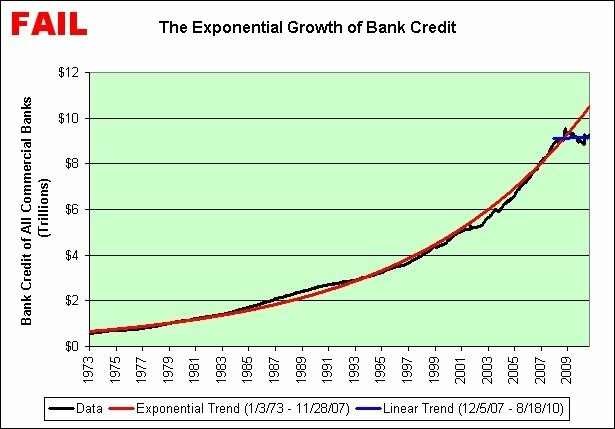 Banks "Too Big to Fail"
The 1970s have nothing on us, in my opinion. I don't have to be right on the entire list. Just a few from the list should be good enough. 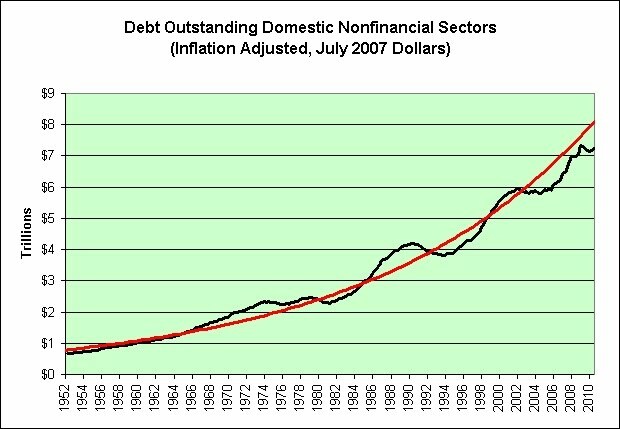 I underestimated the deflationary forces of the credit crisis. It temporarily provided much higher real yields. The overall premise still holds true though. Real yields are lower now than when I wrote that back in 2008. So here's my 2008 list of general predictions and observations for the New Year (and quite possibly for many, many years into the future). There are too many houses. There are too many restaurants. There are too many shopping malls. There are too many airlines. The era of cheap food is over. 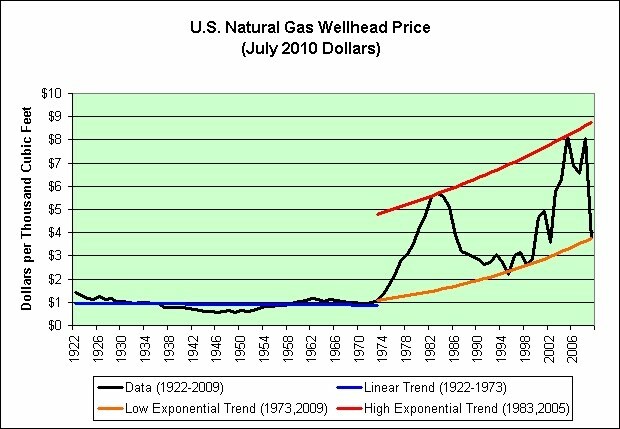 The era of cheap energy is over. Unemployment will continue to climb. 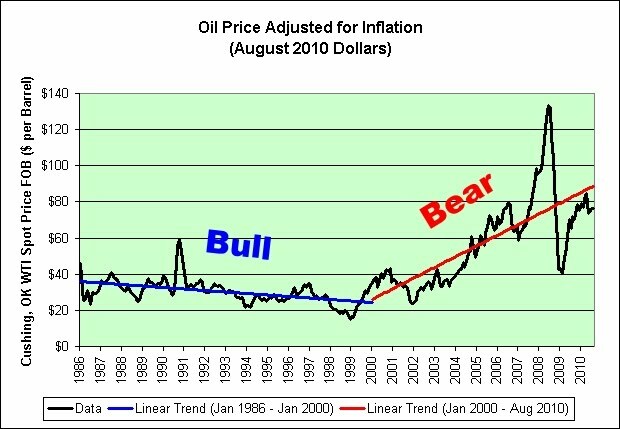 The stock market will stagnate (inflation adjusted). 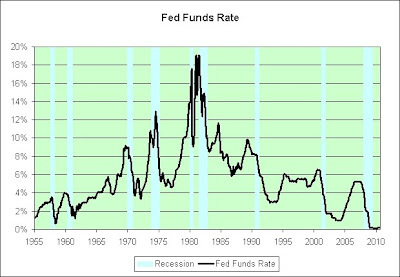 Real (inflation adjusted) yields will continue to drop. China will not decouple from us, nor will the rest of the world. Stagflation (slowing growth with above normal inflation) will continue. 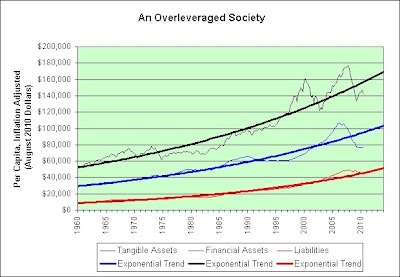 I also believe that these trends will continue far longer than most (those who have only been investing in the 1980s and 1990s anyway) think is even remotely possible. In hindsight, above normal inflation did not continue. The stock market did much worse than simply stagnate. From what I can see, cheap food still exists. Although I am currently of a deflationary mindset, I do stand by all of those predictions over the long-term though. It does not paint a pretty picture for the future. Has the government done anything to address any of my concerns from the list? Extend and pretend does not count. Here is the real risk: if banks do require another rescue the political consensus to do it quickly and effectively will not be there. The United States has squandered its opportunity to address the fundamental problems, choosing to extend and pretend and to prop up asset values. It will be interesting to see what Plan B is. Plan A was a saver's nightmare. I expect Plan B to ultimately be more of the same. The first example comes from the Bank of England. The BoE, in June 1999, auctioned off gold reserves to the lowest bidder. That is not true. There's a huge difference between "lowest bidder" and "lowest accepted bidder". The BoE used dutch auctions. The dutch auction is actually a very efficient, rational, and fair way to auction off a large quantity of identical things all at once. Google even used a dutch auction for their IPO. In hindsight, the BoE should not have sold its gold when it did. However, it has nothing to do with the auction process itself. It most certainly did not just hand over all of its gold to the lowest bidder as he claims. If that was truly the case, then all the bids would have been $0.00. Why would anyone bid more? Free gold! Woohoo! So, um.. I give you the lowest price for your gold and I win? Um, no. If you offer the lowest price in a dutch auction then more than likely you will get nothing. Why? You were outbid by every other bidder. Man, if only people on Ebay (EBAY) would follow this logic. Some people on eBay actually did follow that logic! Unfortunately, eBay had to stop because the logic tended to confuse people. Oh the irony! Treasuries are still auctioned off using a dutch auction system though. Apparently investors in Treasuries are not so easily confused. However, the price that each bidder pays is based on the lowest price of all the allotted bidders, or essentially the last successful bid. The U.S. Treasury (and other countries) uses a Dutch auction to sell securities. The government only accepts the lowest price for its Treasury bonds? OMG! Conspiracy! The government is getting ripped off every time it holds a Treasury auction! Somebody needs to step in there and do something! Contact the press! Write your Representative! Call your Congressman! Tell them you want a formal inquiry! And most importantly, someone inform Jeremy Siegel! My hands are waving all over the place right now in a most conspiratorial, alarmist, and utterly sarcastic manner!